Your new MacBook (or Mac) comes with some built-in Apple screensavers, but you would certainly prefer a bigger variety of Macbook screensavers to choose from. Where can you get some Macbook screensavers from? 1) The Mac app store? You will notice that the Mac app store has very few screensavers. This is because the Mac app store screensavers are not "native" MacOS screensavers; they are applications that try to behave like screensavers. MacOS "real" screensavers appear under the System Preferences, under Desktop and screen savers; not under the Applications folder as with the case of screensavers from the Mac app store. Read this article for the differences of Mac app store screensavers and native screen savers. 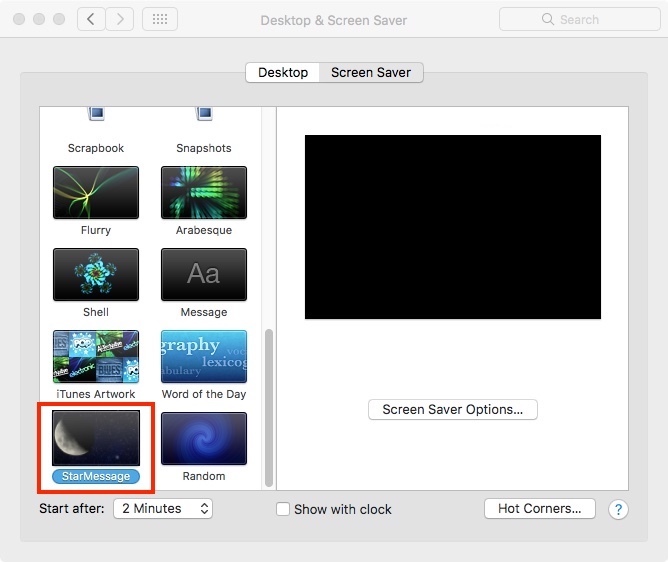 For these reasons, the Mac app store is not the place to find screensavers for your Mac. 2) Screensavers directly from their developers. To add more screensavers to your Macbook, iMac, Mac mini, you should download them from their makers, the developers who built them. The Mac gatekeeper does a good job to filter out the non-trusted developers so you can be sure that the download of the screensaver does not contain viruses. Make sure you are visiting the developer's website, and download and install the screensaver. You can see here how to configure the Mac screensaver. Finally, let us introduce our StarMessage screensaver., a screensaver that does not just create beautiful graphics on your computer screen, but tries to create beautiful feelings in your heart and inspire your mind. Since you are already here, why don't you download the lite (free) edition? Mac Apple store screensavers - Which are the differences from a Mac screen saver?